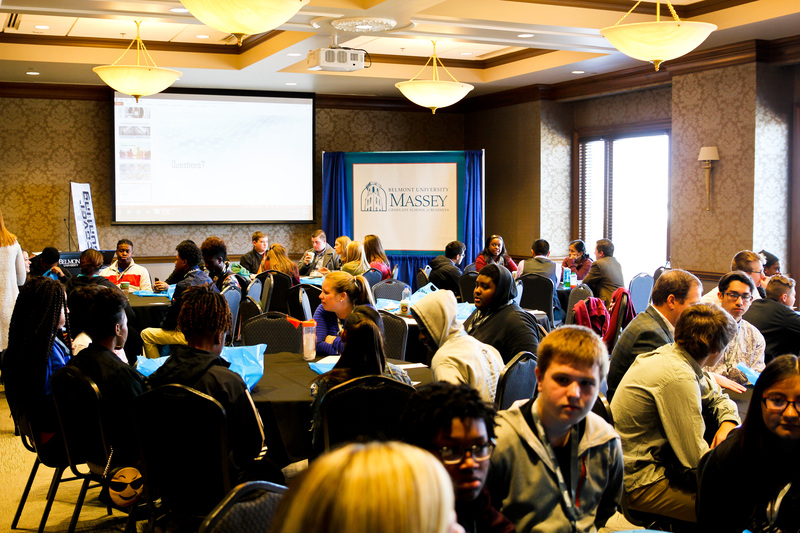 Ninety high school students from the Nashville area attended the Discover Accounting Day at Belmont University on Nov. 15 in the Jack C. Massey College of Business. Students had the opportunity to learn about careers in accounting, why accounting is considered the language of business and to discover which path of accounting best fits their interests and personality. Students interacted with local Nashville CPAs, including Belmont University Masters of Accounting alumni Matt Sherrill (FreseniusRx) and Allie (Shropshire) Zavattaro (Compass East) and Accounting Advisory Board member Kristi Fireline (BKD). Accounting professor Dr. Beverley Alleyne motivated the students with words of wisdom on how to prepare for college and the real world of an accounting career. Accounting major Ashley Francisco delivered a presentation on applying for scholarships and funding an accounting education. In addition to the day of accounting information, the high school students “discovered” the Belmont campus with lunch in the Harrington Place Dining Hall and an end of day campus tour with accounting and business students.